If you’re in the market for a new robot vacuum, today really is your lucky day. The ECOVACS N79S Robot Vacuum Cleaner is one of the best in the business in the mid-range category, but if you snag one today you’ll pay an entry-level price. 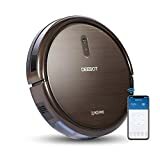 Use the coupon code KX8M6V8X at checkout on Amazon, and you can pick up this $300 robot vacuum for only $159.99!